Arizona Cardinals Defensive Coordinator Todd Bowles against Washington Redskins on Oct. 12, 2014 at University of Phoenix Stadium in Glendale, Ariz.
Bowles doesn’t qualify as a splashy hire. He’s not brash like Rex Ryan or a household name. But the New York Jets’ new head coach is one of the NFL’s great teachers, whose players describe him as a genius with strategy, and the opportunity for Bowles to run his own program was a long time coming. Bowles agreed to take the job late Tuesday, a person with knowledge of the Jets’ search said, speaking on condition of anonymity because nothing had been announced. The 51-year-old New Jersey native was in demand after coordinating a depleted defense that helped the Arizona Cardinals make the playoffs this season. He also interviewed with the Chicago Bears, Atlanta Falcons and San Francisco 49ers. 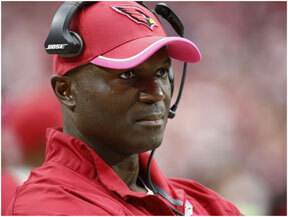 Bowles interviewed for seven NFL head coaching jobs over the previous six off seasons as well as for the job at Temple University, where he played under Cardinals coach Bruce Arians in the 1980s before embarking on an eight-year NFL playing career. But Bowles had spent 15 years as an NFL assistant until now, with the exception of a stint as the Miami Dolphins’ interim coach in 2011 after Tony Sparano was fired. “If somebody deems me as a good head coaching candidate, that’s flattering, but in the middle of the season, you don’t have time for any of that,” Bowles told USA TODAY Sports in October. Now he’ll try to do that with the Jets, who fired Ryan and general manager John Idzik after finishing this season 4-12. They haven’t been in the playoffs since the 2010 season, when they made the second of consecutive AFC championship game trips. The Jets hired a new GM, former Houston Texans college scouting director Mike Maccagnan, earlier Tuesday. While there are some talented pieces on the roster, there is a lot of work to be done as well. Bowles comes across as soft-spoken and low-key. But he can flash some fire, too, as he did at halftime of the Cardinals’ Oct. 12 game against the Washington Redskins, busting a white-board before the defense got four second-half takeaways in a 30-20 Arizona win. Asked that month if Bowles could be a head coach, players were unanimous. “Hell yeah, because he’s got communication skills and he’s going to tell his players exactly what he needs,” veteran defensive tackle Tommy Kelly said then. Bowles’ coaching education began as a young Washington Redskins safety, watching film and learning to scheme under Richie Petitbon and Emmitt Thomas in the mid-1980s. He considers Mike Nolan, Foge Fazio, Bill Parcells and Mike Zimmer among his influences too. Ryan long has been regarded as one of the NFL’s best defensive minds, and Bowles won’t have to wait long to match wits with his predecessor. The AFC rival Buffalo Bills hired Ryan his week, meaning they’ll square off twice this season.